Over the years, I’ve had – we’ve had – many glorious moments with the Dallas Stars. It’s rather hard not to when you have to travel over 18 hours non stop (which, by the way, is impossible due to layovers) to get from where I live to Dallas. It’s approximately 8323 miles (13394 kilometers for those of us who use metrics) between where we live and our beloved Stars. We’ve had to do things the hard way to gain access to them. Back in 2006, I would call my husband, Sam, who worked from home at the time, on my lunch break and he would put the phone by the speaker of his computer so I could listen to Ralph & Razor call the game over WBAP’s internet stream. There was no such thing as Game Centre Live in those days. So when Mike Modano resigned for his final contract in 2005/06, we saved up everything we could and booked flights for our 2 week trip to Dallas – our pilgrimage to our home of hockey. During those two weeks, we had some amazing experiences. Riding the pine while the Zambonis cleaned the ice in the second intermission and then locker room tour during the third period of a Blackhawks game. Meeting our friends from the Stars forum and hanging out, talking hockey and becoming lifelong friends. Going to practices and having Jason Arnott shoot a slapshot at the glass behind Turco where I was standing, then crack up laughing with Philippe Boucher when I flinched and then gave them both the finger. Marty just shook his head at their antics. Even talking to Steve Ott, Johan Hedberg, and then rookie Jussi Jokinen – who I gave a small koala to – were just amazing experiences for us. I’m sure Sam will post his own story about meeting his own hero, Jere Lehtinen – I’ll leave that story for him. 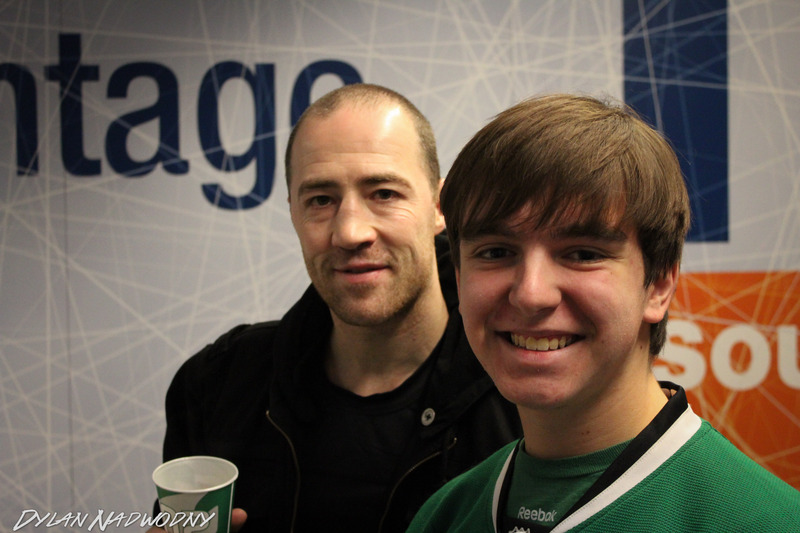 So last night at the game, Ralph Strangis said to find him at practice and he’d see if he could set us up to see Mike Modano. I was looking around for Ralph most of the morning but we couldn’t see him. Practice started and we went in to watch it. We got some great photos, taken by Sam, and Amber and I went to the end of the rink to watch the guys practice. He told me he’d been trying to hook us up with Mike, but he wasn’t sure if they’d be able to do it because Mike had a commercial to shoot today and he was a little cranky about a few things Ralph asked him to sign for something – I think a celebrity Auction. Anyway Ralph called Rob, the Senior Director Hockey Communications for the Dallas Stars, over. We said to Ralph, “He’d be called ‘Bluey’ back home because he has red hair!” so now Rob has been christened ‘Bluey’. Anyway Rob was great to us. He said it wouldn’t be a problem to hook us up with Mike and he’d be fine about it all. We chatted away and then he said he’d come and get us when they were ready to film the commercial and we could meet Mike afterwards. I grinned and said, “I know! I’m fine.” And I was. I was shaking because I was partly cold. Have I mentioned it’s FREEZING in Dallas right now? Anyway Mike was done pretty quick with the commercial – he must have got it right the first or second time, and I think it meant he was done for the day so when he came out, he seemed pretty happy. And Rob said, “She saw The Mighty Ducks.” Mike…god bless him, he blushed so bad and looked at the ground and shook his head with a grin, saying “Oh no!” I laughed and grabbed his arm lightly. He looked down at me – because he towers over me (I’m 5″6, he’s 6″3 in bare feet!). I said, “No, it wasn’t like that!” And Sam went on to explain that I saw him playing first, not the talking part. He nodded and said, “Oh, that’s so nice.” He asked how long we were here for and I said until April 1st and he asked where we were staying and I said studio 6 on I35 and Northwest Hwy. He nodded and then I said, “Yeah, we know it’s the “cultural part” of Dallas!” and he laughed so I think he knows the area is full of strip joints! Yes, we picked the prime part of Dallas to stay! He turned it around and he was like “Oh wow! This is so great! Thank you so much!” We said he was welcome, and he posed for a photo with me holding up his jersey. He put his arm around my shoulders, and I put my arm around his waist – he’s so small width wise – I mean, he’s tall, and he’s solid, but wow, he’s tiny. He was very, very sweet to us and seriously he was just so much more than I ever expected. He’s a wonderful man, and though I doubt he’ll ever see this site, I just want to say thank you Mike for being a gentleman, a good sport and a wonderful role model. I didn’t get to say all that I wanted to, but that’s okay. I was able to spend a few minutes with you and I know how busy you are, so to generously give a few minutes of your time to someone who has travelled such a long way to see you play just meant the world to me. I said to him, “Good assist last night by the way,” and he smiled and said, “Well, thank you very much.” I added, “It was a shame you guys didn’t win on Monday night,” and he was like, “Um, yeah, well uh… you know,” and I continued on, “But you know what? It was still the best game of hockey we’ve ever seen!” He laughed. I also said thank you for beating the Kings (he laughed), and that we were in the air flying from LA to Dallas at the time of when they were playing, and Sam told him I was cheering them on in the plane, which of course made me blush but Mike laughed and said something but I can’t remember what it was. Mike also said that he hoped we had a great trip and that he might see us again and we said thanks and he left. I’ve been on cloud nine ever since. Rob didn’t have any business cards on him at the time after Mike left so he said to wait and he’d run and get one since we gave him one of our on the cheap ones that we made this morning – got some business cards and a rubber stamp that you can change the words on – worked out pretty well. When Rob came back, he said that Mike really enjoyed talking to us. I was a little skeptical but he said that Mike loved the jersey, that when he was walking back to the locker room, he was holding it up and saying, “Wow, this is amazing! This is great!” So I’m really glad he liked it. It was something I wanted to give him, just for no other reason than the Stars have hosted us, and it’s Australian custom to give your hosts a gift of some sort to say thank you.